Tonight we stayed in a different hotel closer to Songhua River, which is closer to the other end of Zhongyang Street. Home Inn is a hotel chain in Mainland China and I’ve found their AC to be much more reliable than American hotels (Crowne, Holiday Inn, Hyatt, etc) in China. Chinese hotel rooms are generally smaller and cheaper than American hotels. A single room with double-sized bed was around ¥180 RMB per night (~$30 USD per night). We went to a restaurant a few blocks from the hotel that advertised to have free Wi-Fi. However, their Wi-Fi wasn’t exactly free.. I think you had to be a subscriber or have a Chinese mobile number in order to log into the Wi-Fi. Anyhow, the restaurant had their menu on their wall. A photo of each dish was displayed on the wall and each dish was referenced by a number. The portions were on the larger size, so we only had two dishes with rice. 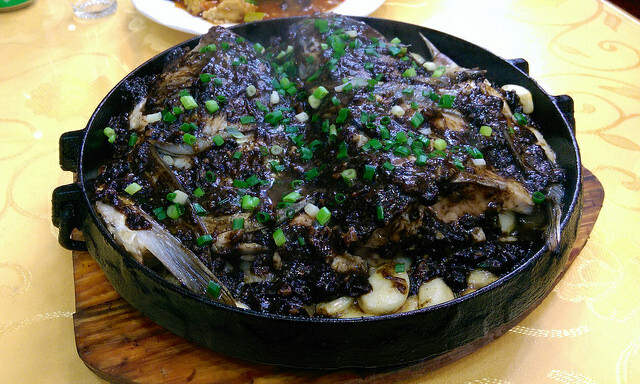 My favorite dish out of the two was the fish with black bean garlic sauce in a skillet. The fish was completely covered in black bean sauce, and there were tons of garlic underneath the fish. Fish is always good with lots of sauce and flavor. It also makes me a happier person when the bones are bigger! Fish with small bones are just too much work for me and makes me go nuts.